Question: What 3 non-clothing items would your spouse pack for a trip? Alexia says: "Rob would pack the book he's currently reading, his ipad and coffee for the trip because you can never trust that you can find good coffee when you're out of town!" Rob says he would REALLYpack: "books, music, and sunglasses (I'm always looking for the perfect, cheap, pair), a great source of affectionate teasing from my wife!" Rob says: "Alexia would pack lip balm, travel size toiletries - which are an essential purchase for EVERY trip, and it is a mystery to me what happens to them after the trip, and lastly, snacks for the trip." Alexia says she would REALLY pack: "my current knitting project, snacks for the trip and my watercolors." Each of them got one thing right so I guess this round is a tie! I make these all the time for gifts, but finding fabric appropriate for men is always a challenge. MicroMod is very man-friendly.....my hubby didn't even turn up his nose at this bag! I'm super in love with metal zippers these days! Just be warned, you can NOT sew over those metal teeth! I hand-turned my machine when I got near the zipper so I wouldn't break a needle! I would highly suggest adding a tab at the end of the zipper or a handle of some kind to make opening and closing these types of bags easier! As you can see, I left my seams exposed--I zigzag stitched over them to prevent fraying. These bags hold a ton! I'm talking full size shampoo bottles! I cut my fabric 14.5"x18" for both the interior and exterior piece (if using Kaelin's tutorial, just cut the large piece into two 14.5"x 9" pieces). Since the fabric is quilting cotton and I like the bags to stand up on their own, I used ShapeFlex (Pellon SF101) on both the exterior and interior pieces. You can also use batting or fusible fleece for a softer feel. Now, about that sew-along! You can sew along by tagging your projects on Instagram with #microMod , posting on the Green Bee Patterns Facebook page, or adding to the microMod flickr group. You can keep up with the stops on the sew along by checking Aleixa's blog or on the Cloud9 Facebook page! For my part, just leave a comment on this post and enter for a chance to win a FQ bundle of MicroMod and my favorite pattern of Alexia's, Lots of Dots! Seriously, it's so cute! You have until April 11th at 10pm Central to enter! International entries are welcome for my giveaway! Oh, and check out my Instagram feed (kelbysews) for a chance to win the 2 boxy bags!!! Love MicroMod and you have the perfect fabric for the boxy pouches! That was a cute q & a with them! I'm not sure my husband and I would get more than 1 right either. This line is seriously tempting me. It's so beautiful. What a great project. I love them. Gosh those are cute girl!! I'm a huge fan of MicroMod, but haven't had a chance to order my bundle. Fingers crossed that I'll win this one ;D. Thanks for giveaway! cute project, interview, fabric. Fun! This line looks so fun! I love the pouches u made!!! Thanks for a chance to win!!!! Great fabric, great project, great giveaway!! Thank you!! Your bags are super cute! Thanks for the giveaway. Having trouble posting so sorry if this is a repeat. I'm loving those micro mod prints and the bags look perfect! I am always looking out for good man fabrics for this household - no flowers or pink welcome. Love your travel bags and the interview! And of course MicroMod! I want to make my husband a quilt in case he deploys when we pcs back to Fort Hood this summer and MicroMod has a lot of great manly prints! Thanks for the chance to win! I love those boxy pouches and you have chosen the perfect fabric to make them with! Thanks for great inspiration! I am adding these to my "Must Make" list this instant - great project!!! Thanks for sharing and for the chance to win!! The travel bags are fantastic!! And I am loving this fabric! I'm a total fan of dots, and these are fantastic. Thanks for the chance to win some. Love those box pouches! I definitely need to make some of those!! I love the boxy bag pattern. The bigger size is fab! The fabric is perfect for his and hers bags! Thanks for the tutorial links too :). Looking forward to this sew along! I love that pattern too. great boxy pouches! Thanks Kelly! My husband uses a box pouch just like that for our trips, but it's getting a little (a lot) grungy. Maybe I could tackle this. This collection is supercool and I'd love to win some -- thanks!! Great interview & your bags are so cute. Thanks for the chance to win some of this lovely fabric. Love the bags! I have made smaller ones, but think I'll have to make some bigger ones as well, since these ones seemed great! Love the pattern you showed us, and the fabric! You're right, finding "manly" prints is hard to do. Thanks for the chance at two great prizes. I'll try this to-day!! Thanks, that's what I'm looking for my cards! Love your boxy pouches; especially in micromod! Thanks for the chance to win. I keep seeing MicroMod around blogland and everytime I like it more than the last! It's time to add some to the stash. Thanks for the tip on the metal zippers, I haven't used them yet. Love Micromod! and your boxy pouches are great - I love them! This is such a great collection, and I love that pattern! Loving the idea of a 'down & dirty' wash bag! Looks like a great hop. the more I see this fabric line the more I like it, thanks for the give away! What a great project! I will give this a try, very soon! Thank you for the give-away! LOVE your bags... i find myself going to the box bag for instant gratification... these prints are gorgeous! i love them. great box pouches Kelly! so what three things would YOU pack?? also my favoirte green bee quilt pattern! I love those boxy pouches! Love these fabrics. Great job on the bags,too! Yay! I love these fabrics and can't wait to see what he designs next. I think my husband would like these too! Might have to give it a try! I love finding new fabric lines with guy-friendly fabrics! Thanks for the chance! Love those bags and the fabric! Would love to get my hands on it. Thanks for the giveaway! Making a box pouch is at the top of my list! I like that you used a metal zipper...what size zipper did you use? Wow your boxy pouches are gorgeous. I love these bags, they look great! Good, masculine prints are difficult to find. 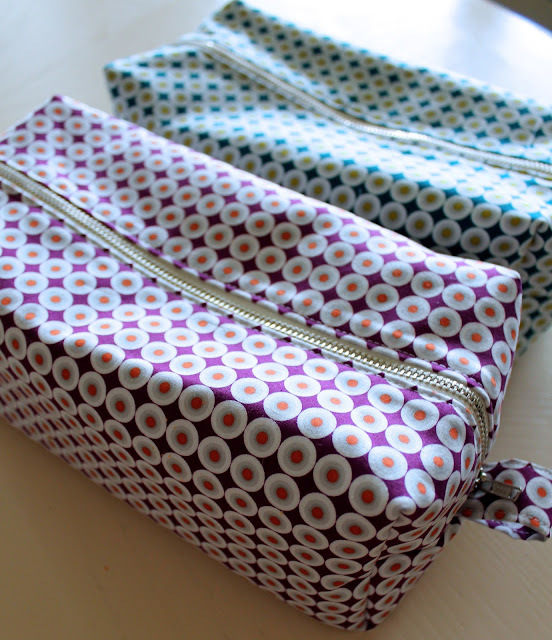 Love the boxy bags you made and thanks for the opportunity to win some Micro-Mod and a pattern! oooh - very nice. This is going straight to the top of my list of makes waiting the day when my baby allows me to put her down for more than five minutes without crying. I reckon a neat boxy pouch will be just the thing for the diaper bag. Love the pouches. I may have to make more. I love this fabric stack - thanks for the chance! The boxy pouches are awesome...must make some soon! What yummy fabrics! I'd love to make some boxy type storage bags for each person (store stuff w/o it cluttering up the countertop). Thanks for this post! More to make's to add to my list once my sewing machine is back from the shop! first- i love the pouches. seriously. and metal zippers...who knew they'd be so cool looking? I am just starting to put hidden seams in my pouches, but sometimes...exposed seams is just easier. Love the bags!! And the fabric is new to me as well. Thanks for introducing it!! Pouches are great!! I see them being used for quilting tools. Love MicroMod and what awesome pouches! Thanks for the chance! Your bags are so perfect, just what I have been looking for!! I LOVE this fabric!! I'm here from Cloud 9's Facebook page. Really love the bags and the fabric ~ thanks for the giveaway! Nice fabric print, alike but different. This is a good size for traveling. Thanks for the tut. what a great line! i love your metal zippers. the look is so classy. Sweet bags! I'm still fighting with fusible interfacing. No matter how well I follow the directions, it won't fuse the entire piece. Am thinking that my iron just doesn't get hot enough. Thanks for the link to the tutorial! I loved it! These boxes are great. I've been meaning to make some. I really could use a new travel pouch! Love the fabrics ... truly micro mod :) I will put it on my list to make! Micromod. What's not to love?! I haven't even seen the Lots of Dots pattern before! Where have I been? I'm keen to try some curved piecing and this could just be my ticket! I love the fabric and your pouches! So fun! Oh thanks for the chance! I keep eyeing this collection. I like it more every time I see something made with it. Must make a travel pouch for hubby's birthday this month, they're so cool! Cute bags! And love those metal zippers. These pouches look nice and roomy, and I like the metal zipper as well. I just saw some metal zippers at a thrift shop for 25 cents. Need to go back for those! Thank you for the giveaway! These pouches are great. I am always scratching my head for man gifts! Beautiful fabric. Love the boxy bags. Thanks for a chance to win the bundle. Oh, cute! Where do you get your metal zippers? Online, or is there a good place around. Love! Love this fabric. I am working on a zip pouch using Tick Tock White. Love the colors!! What a fun project - one can never have enough travel bags in a suitcase to keep stuff organized. Thanks for the give away! Love this line and your bags. I might give them a try. Thanks for the giveaway. This is awesome fabric! And the pouches rock! Your pouches are so cute! Perfect choice of fabrics! Oh those look so great and the fabrics are lovely! Thanks for sharing and the give away! i would love to win! love the fabric and pattern! Nice bags, so useful. Thanks. i ADORE this line! and love the boxy bags! thanks! What awesome boxy bags! Love the fabric! :) Thanks for a chance to win! NEAT BAGS! THANKS SO FOR SHARING! Love the Micro Mod fabric, it is so tricky to get grown-up male fabric!! these are such cute bags! thanks for the chance to win! Hmm...I'm in need of a new travel bag (although I certainly don't need another new project!). What the heck...it's too cute! My husband would pack his contact case, contact solution and about a dozen books of which he would MAYBE read one! Thanks for the giveaway. Love the fabric and your pattern. I can't wait to make one!!! Enjoyed your post & love your pouches! Loving this fabric! Thanks for sharing the boxy bag, lovely. Love this project! I need to make one of these for my husband. He always ends up sharing my bag when we travel. Beautiful job on your boxes. This fabric looks good in anything...I just love it. Thanks for the chance to win. Love these fabrics and what you did with them, thanks for the giveaway! Love these bags! I can't wait to make them! Those bags are so gorgeous, and fabric selection for that pattern would just be too much fun. Thanks for the giveaway. I really love the boxy pouches with that fabric line! Great job. His & her pouches... I like them. Thanks for the giveaway, and the pouches are fantastic. they turned out great! thanks for the pattern links. i def. want to make one of these bags!! those pouches look adorable in this fabric line! This is an awesome fabric line. I would love to win it. I've never tried a boxy pouch, thanks for the tutorial links.